What is there to say about dessert? Utterly pointless, because by then I’ve usually eaten quite enough, thank you. And yet, utterly irresistible too, because I do have a bit of a sweet tooth. So I am usually quite happy eating out when someone suggests Let’s get just one and four spoons. And yet, the ability to create some of those magnificent concoctions fills me with admiration, especially lately as dessert seems to have become more and more creative. So I was really glad that I persuaded one of the top pastry chefs in New York to take a bit of time to chat. Charmaine McFarlane told me about her inspirations, some of the challenges she faces, and how much she loves a silky-smooth custard. Charmaine McFarlane does have a website but she is much more active on Instagram and Twitter. Dessertworthy, which Charmaine mentioned, seems to me an entirely good idea. 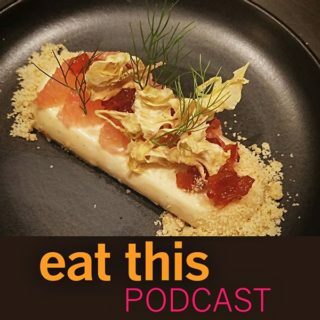 The cover photo may look like some sort of fancy omelette, but it is actually Charmaine’s grapefruit panna cotta, with semolina and olive oil cake, wild red juniper and grapefruit marmalade, citrus crumble and fennel chips. I wish I could tell you what it tastes like. Playing us in, Dinah Shore. Playing us out, Guy Lombardo and his Royal Canadians. My site accepts webmentions. If you have responded on your own website with a link to this post, enter the URL of your response in the box below and click "Ping me!". Your response will appear here. If you update or remove your response, re-enter your post's URL and the change will be reflected here. An Interview with ‘Eat This Podcast’. | Buttery. Salted. Caramel. An Interview with ‘Eat This Podcast’. | Buttery. Salted. Caramel. mentioned this article on butterysaltedcaramel.wordpress.com. Gourmetmetrics liked this article on twitter.com. Charmaine McFarlane mentioned this article on twitter.com. Is dessert a pointless overindulgence, or perhaps the most interesting and creative part of a good meal out? I know what I think.